During Ganesh Chaturthi, Bombay becomes a huge festival land, with ten days of lights and decorations in every nook and corner of the city. Well, almost. What used to be real fun in my childhood days was when we used to get together on day 1 when the idol is 'brought in' and day 10 especially, which is the day of immersion, to see in awe idols of different kinds of shapes and height pass by the street where we lived. The idols were led by a huge procession of people dancing in rhythm to the beats played pompously by their respective music band groups especially hired for the occasion. Different areas in the city competed against each other and still do as to who had the tallest idol and what kind of decorations were conceived and displayed. There were and still are unwritten agreements as to whose idol will have the right to leave first or last for the immersion, etc. There are easily millions of people who come out to the streets on day 10, the immersion day, in order to view the huge idols that are brought to the sea to be immersed. The offices close early on that day, and the city comes virtually to a stand still for several hours due to traffic of all kinds - people, idols in processions and vehicles, with the police having a nightmare of a time trying to keep things in order. For people who are not from Bombay, I have included this link I found on YouTube, just so that people can comprehend what I just wrote regarding the significance of day 10 http://www.youtube.com/watch?v=Zs3417fl32Y&feature=related (this is just when this famous idol is being brought out for the immersion journey). During the celebrations when people gather to get a glimpse of the God, lines can be so long that they have to wait easily for 7-8 hours to get their blessings. In my childhood days, there used be a lot of apartment buildings that celebrated the festival with great aplomb. My apartment building used to do it as well and we celebrated it for all of the 10 days. There would be daily poojas, and at least one daily event - a performance by the talented women who lived in the building, or calling in the magician etc. ; fantastic sweets and other savories were cooked everyday as offering to the God; and when night set in one could walk around the neighborhood and catch a select choice of movies being shown on the streets, by tying a screen in the middle of the street and people sitting on the sidewalks, on the street itself on either side of the screen, and from their apartments to watch the movie. Gone are those days now. On specific days my friends, families included used to go around the city to see the most famous idols. In order to get in by avoiding the queue, we had to make 'special' arrangements with 'known' people :-), with whose help we would be whisked away through the rear side of a building and come out right next to the idol displayed. I really miss the celebrations back home for the fun we had, the social aspect of it, how it made Bombay livelier than it always is for 10 days, and the festive atmosphere. Not to forget the food and the late night movies. 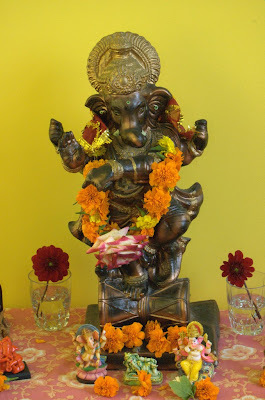 I still try and visit India during Ganesh Chaturthi time whenever feasible. 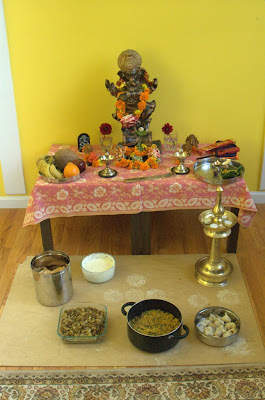 Ganesh Chaturthi Celebrations here in the US: We decided to celebrate Ganesh Chaturthi this year at home, keeping the idol for 1 day. 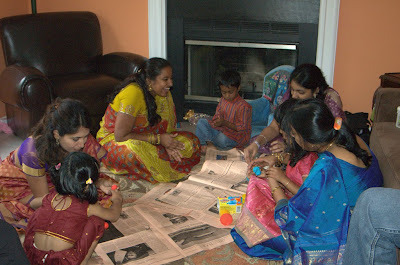 We had our friends living close by come over for pooja. We did aarti and sang a few bhajans. This was followed by a potluck feast. 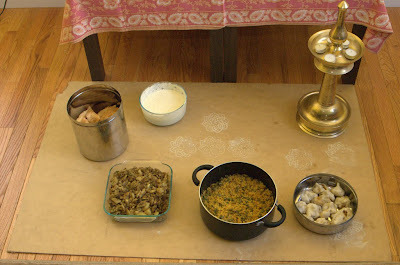 The dishes that were prepared included modak (rice dough steamed with coconut and jaggery mix - Ganesha's favorite sweet), Karanji (made with fried all purpose flour puffs stuffed with coconut, sugar, semolina and ghee), srikhand, tamarind rice, potatoes, black eyed peas usal, and usli (made with green beans and pulses). 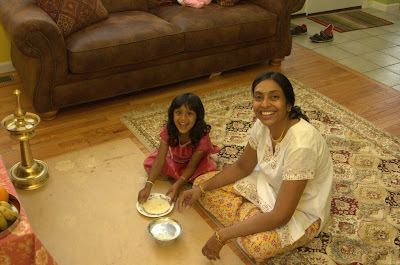 I will post the recipe for some of these dishes on my other blog, www.bigsrisfood.com. After lunch, we had a few activities for the kids (four of them, including my daughter). 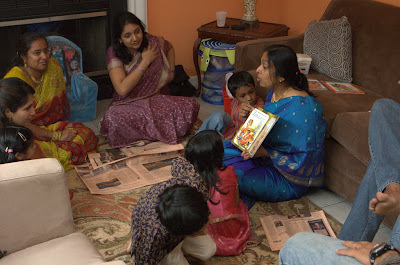 We read to them Ganesha stories so that they could become familiar with the God and the celebration, and the symbolism of Ganesha. 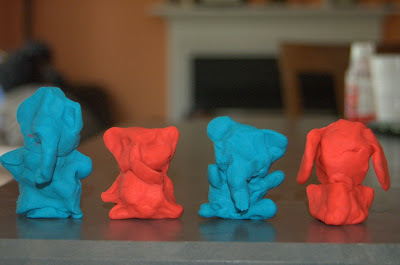 Then we had all of them sit down and make a puppet of an elephant. 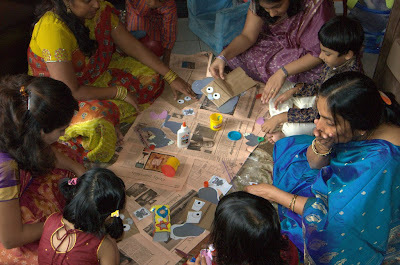 Finally the mommies got together with the kids and helped them make their own Ganeshas with play doh, which was very cool. I have taken pictures of the same. The kids had a lot of fun and so did we. A great day spent with friends and family, and on a festival so near and dear to all of us. Here are pictures from the event.